ePublishing Knowledge BaseePublishing Knowledge BaseePublishing Knowledge Base Common QuestionsI have Google News, but my articles aren't being indexed. Why? Questions on any of the below? Contact your ePublishing Solutions Manager. Check for Google Webmaster errors for the Google News Sitemap. Zoom: Check for Google Webmaster errors for the Google News Sitemap. Make sure that you actually have a Google News Sitemap in place. Go to your ePublishing Admin tools under System Settings. Confirm you have a field that says official.site.name and one called official.google.news.site.name. 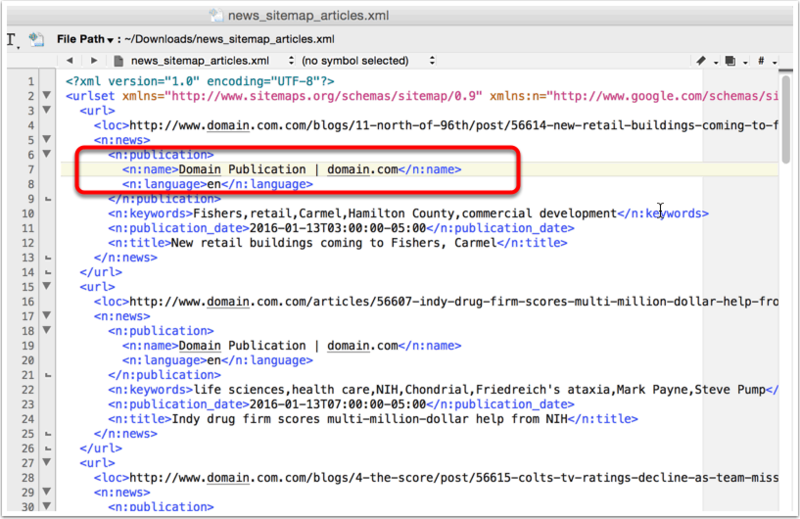 If you have a sitemap, confirm the same name listed for official.google.news.site.name is also entered into Google Publisher News. Zoom: Go to your ePublishing Admin tools under System Settings. Confirm you have a field that says official.site.name and one called official.google.news.site.name. You may also export an article or blog post as XML to view the name. Zoom: You may also export an article or blog post as XML to view the name. Here's an example of XML code and where you'll find the name. Go to Google News Publisher Control Center > Details / Source > NAME field to see the name that Google is expecting. Zoom: Go to Google News Publisher Control Center &gt; Details / Source &gt; NAME field to see the name that Google is expecting. Make sure that the name in the official.googlenews.site.name in your Admin matches the name shown on the Google News Publication Control Center name field. Zoom: Make sure that the name in the official.googlenews.site.name in your Admin matches the name shown on the Google News Publication Control Center name field. Prev: What are valid test credit card numbers I can use to test my shopping cart? Next: What are best practices associated with Retina Display / high-definition (HD) images and your website?